Lucky Bamboo grows in soil or in water alone. If grown in soil, keep the soil slightly moist and water when the top 1 inch of soil is dry to the touch. If grown in water, keep the roots covered with water at all times. Dilute an all-purpose houseplant food to 1/10 the strength directed on the label. 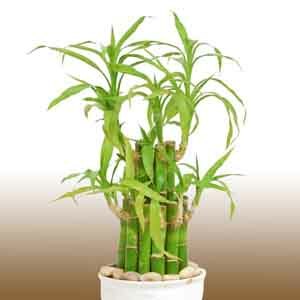 Apply every three months for Lucky Bamboo grown in water or every month for Lucky Bamboo grown in soil. If the stem turns yellow from the base of the stalk up, then plant may have been over-fertilized. Change the water immediately and do not fertilize the plant for a couple months. If the entire stem and leaves suddenly turned yellow, then your plant may have been sunburned. Make sure it's not located in direct sunlight. Minerals and fluoride in tap water can cause yellowing of the leaves. To avoid leaf yellowing, use distilled water or rainwater. Multiple stalks can be split into more than one container, if desired. When bamboo shoots are restricted by the current container or if the roots are restricted inside the pot, then you should transfer your plant to a larger pot. Lucky Bamboo plants require minimal maintenance. Simply remove dead or yellowed leaves, as needed. If the plant becomes top heavy with too many leaves over time, use sterile scissors to trim off side shoots one inch above the base. Cut the offshoots only, not the main stalk. Set Lucky Bamboo plants in a bright location, but not directly in sunlight. Too much direct light will burn the leaves. If the leaves turn yellow overnight, move the plant further from its light source. When the plant is grown in water alone, dump the water and refill with fresh water every two weeks. Use distilled water or rainwater, to prevent the fluoride in tap water from turning the leaf tips brown. If the plant is getting too tall, cut an offshoot from the main stem one inch above the node. Set the newly cut stalk in two inches of water and wait for roots to grow. In a few weeks, the new plant is ready to continue growing in water alone or potted in soil. Sunlight eventually causes algae to grow in water. It's a natural occurrence and a sign the water is due to be changed. Replace the water, plus scrub and rinse any rocks submerged in the water. To limit the water from turning green, move the plant to a less sunny spot. This is a sign of the roots rotting from over-fertilization or over-watering in plants potted in soil. It's a drastic situation and the plant may not be savable, but it doesn't hurt to try. Cut off the unhealthy, brown stem and attempt to start new roots by setting the remaining healthy stem in water. If you'd like to add mood-boosting plants alongside your lucky bamboo, here's a list of 10 Indoor Plants for a Healthier Office.